Teaching some Stevie Ray at Lonestar Amps! 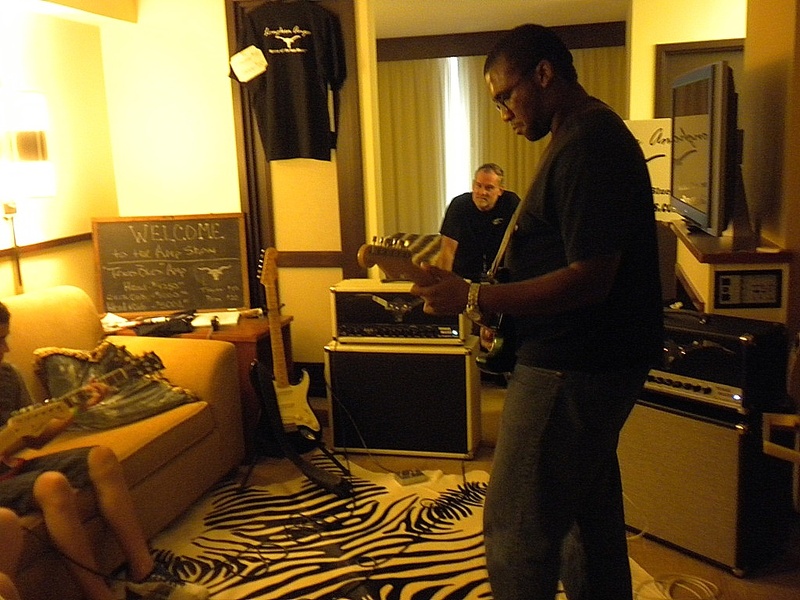 Last Saturday and Sunday, The Hyatt Place Hotel in Brentwood, right off Old Hickory was invaded by over 50 manufacturers of all things electric guitar and then some. The Nashville Amp Expo kicked off at 11 am on Saturday with the entire Hotel under their control. This was a lot different than the LA Guitar Show I attended several years ago, which took up the ballroom of The Roosevelt Hotel and was as noisy as a Guitar Center mid afternoon on a Saturday. An excellent full color Program was available at check-in as well as T-Shirts, goodies and giveaway sign-ups. There was a full two days worth of seminars which I was not aware of since I had not visited the site, but, instead had the flyer attached to the fridge since the summer NAMM. I decided to not look for certain vendors since I would have had to trance up and down the elevator several times. No, the best way was to go for the 2nd floor and work my way up to the 5th. The layout was great. It was only possible to get a few people into each manufacturers set up in each hotel room. This provided for almost a one on one presentation, sometimes with the door open and sometimes closed, depending on how loud things were getting in the hallway. Well, I had to start at one end which happened to be Soloway Guitars with Jim Soloway. Jim had a unique approach to building and playing. He had a couple of styles. The Swan with its 15” width gave the appearance of a 16” or 17” semi hollow body with its chambered body raised some curiosity. The unique width of 1 13/16” at the nut and 2 3/16” at the bridge provided some ideas for a fingerpicker like me. I stumbled a little bit with the “wider than a Martin” feel, but could see some real unique possibilities. There was a lot to see as I worked my way down and there were certain builders I wanted to get to. One of which was Bluesman Vintage Guitars , since I had met the owner during NAMM at The Wildhorse Saloon. There has been a lot of buzz on the Tele Style guitars being turned out by this local builder. They even had a giveaway. I haven’t been contacted so I guess I wasn’t lucky on that one. The best piece I found there was a fat neck vintage looking Tele Replica with the typical early Broadcaster finish with plenty of spank and detail. The specially wound Nunley Wade pickups were a double plus. The Timmy Pedal built locally in Murfreesboro, TN was an Overdrive I will remember from that suite. Richard Goodsell in form on the finest in Atlanta Boutique. Richard Goodsell at Goodsell Amplification gave a detailed view of his ideas and different formats of Amplifiers. Where else can you meet with the actual designer and get to play his own Goodsell Serial Number one Super 17 Mark III with a tag that said “Do Not Sell”. Goodsell had a wide variety of preamp formats to fit the output tube configuration. Goodsell probably had the best looking amp, a 10 watt Baby Blue number. I wanted to try out the Black Dog 20 Watt to find out if he was after a JTM 45 or maybe Jimmy’s Supro. Richard did identify his orange amp as very “Supro” sounding. It was all interesting, in fact the most detailed of any manufacturer at the show, but, I had spent so much time with Mr. Goodsell and VIP Guitarist Ted Dillard that I had to go before I ran short on time. 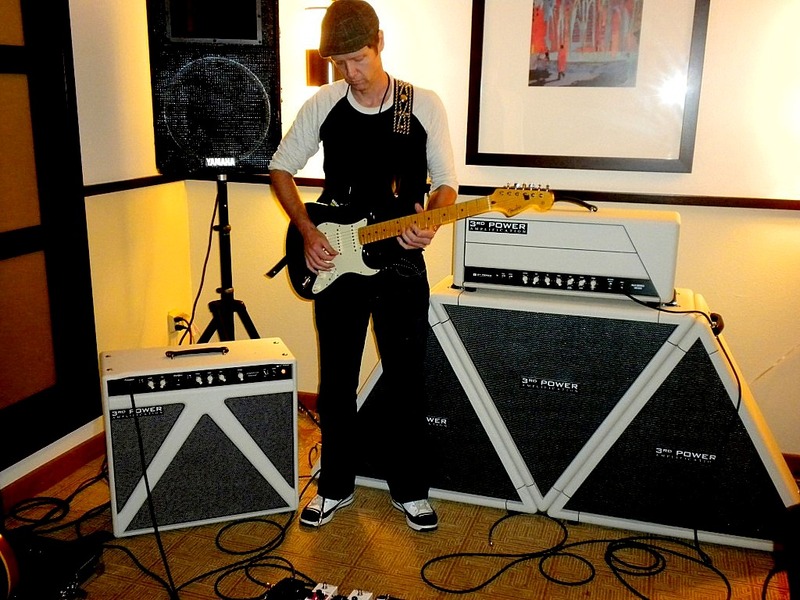 Richard Goodsell brought a wide variety from his headquarters in Atlanta, GA.
After hearing the detailed sound in Goodsell Super 17 Mark III number one, I really wanted to go direct head to head with Sam Timberlake’s newest Samamp . Sam had brought several pieces up from his shop in Birmingham, Alabama including the eye catching round amp. Sam showed us his newest piece, the V.A.C. 40. Samamp VAC 40 makes its Debut! It was wrapped in Espresso brown ostrich tolex with a neutral screen and a cabinet the size of a Bassman that could house 4 10’s but instead had one twelve inch Jensen. Now this was worth pulling out my Epiphone Broadway from the gig bag that kept hitting people and knocking over drinks. The idea was to get a bigger sound with the bigger cabinet. The 40 watts gave plenty of headroom and could be dialed back to 3 watts with his proprietary attenuation system. This allowed the amp to play at many different levels but also allow it to saturate sooner as the preamp section and the wattage inter played in a very musical way with some chime without being overly bright. My Epi sounded incredible without my usual Keeley Compressor on the front end. In fact, I was so impressed; I’m ready to replace my current Dr. Z Stang Ray that I am using on my current project. 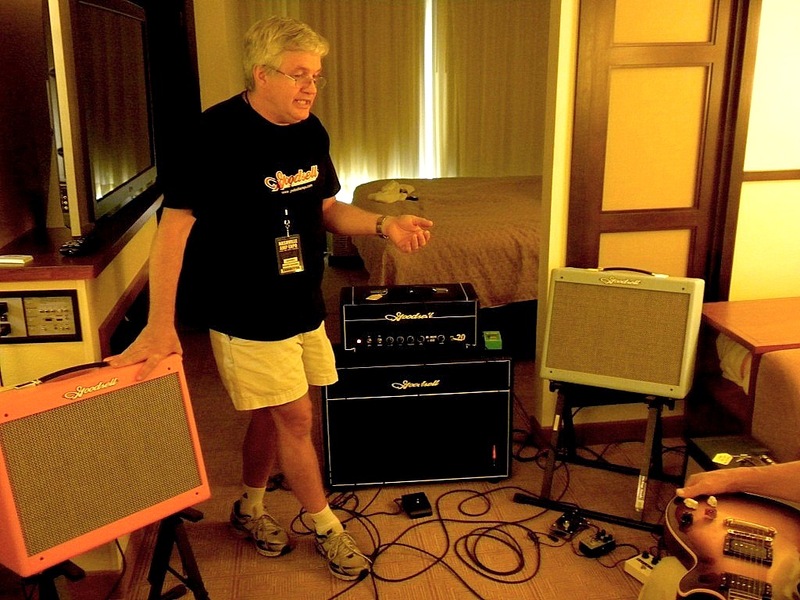 It took me looking over piles of amps before I was happy with that Stang Ray. Sam blew it away with the newest amp that is not even in stock at Corner Music yet. This was part one of a two punch knockout with Samamp . He had an innocent looking vintage tweed piece called the VAC 23. The VAC 23 at little net weight it was a giant killer. 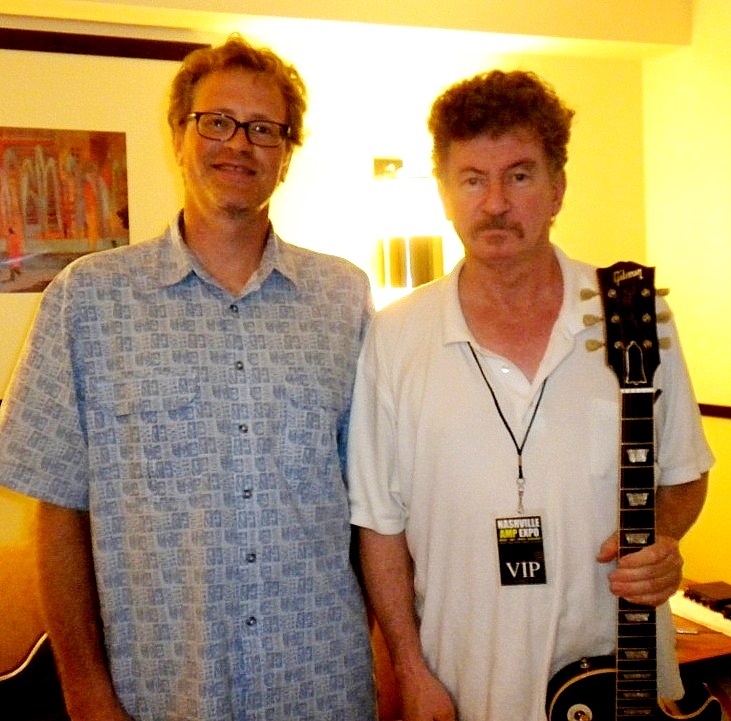 Guitarists from Nicky Moroch to Tom Hemby stopped by and kept saying the VAC 23 was the best kept secret of the show. Other vendors were dragging their friends into try it out. The VAC 23 had the ability to set it full out and just back off the volume to create a clean chime. Turn the volume knob on the guitar to 10 and the amp then had great overdrive saturation. The VAC 23 was very touch sensitive. I think this amp will be destined not to just be a show favorite but a classic tube amp in the annals of guitar history. Again, I spent too much time at Samamp. It’s too easy when it is that good and you get to watch session men one after the other get a huge smile on their face and just keep playing and playing. 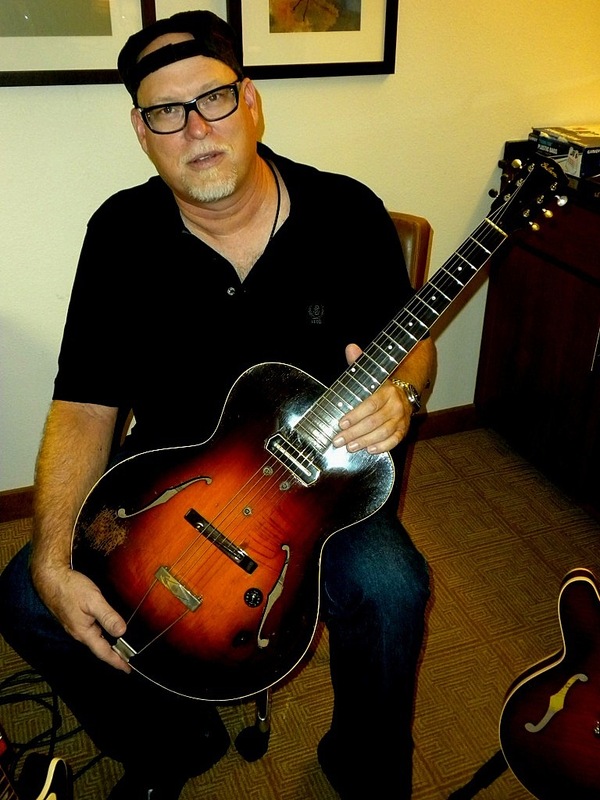 There were a few dealer s that one would see at Vintage Guitar Shows most notably Dennis Weaver of Big Orange Guitar strumming on his 1939 Gibson ES 150 with the original Charlie Christian pickup. Mike Piper at Redentore (pronounced in exquisite Italian, Ray-dent-ory) was showing skill gained from working with Benedetto in building exquisite jazz boxes. The cool thing about Redentore is they are built here in Columbia, Tennessee. The attention to detail and tone were tremendous. I had to get a picture of the Blonde Santissimo with the Bartolini pickup. I have a thing for Blondes. The thought of getting a world class Jazz Guitar, hopefully a Redentore is still on my bucket list. Redentore in all its Glory! Mario’s Guitar Mill suite was buzzing. 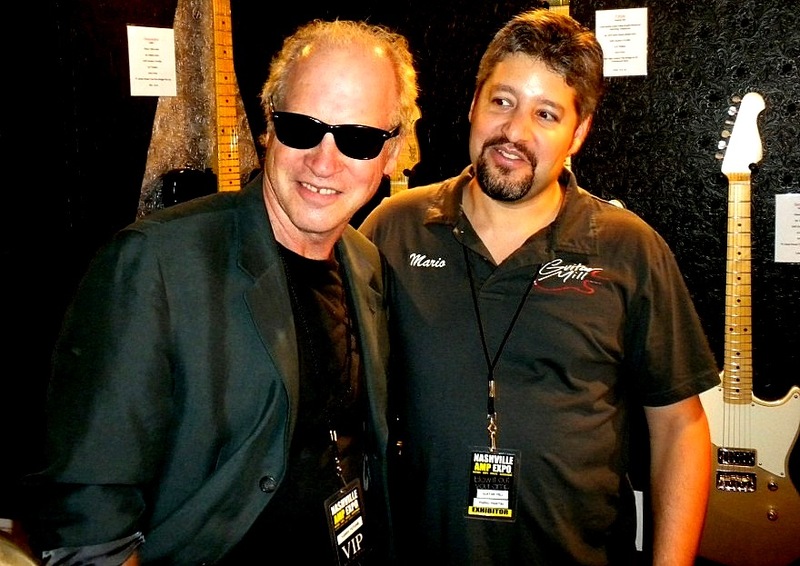 Tommy Tutone (think 867-5309) was giving some details on his vintage Fender while checking out the pride of Murfreesboro, Tennessee. Guitar Mill is known for featherweight woods (with tagged actual weight) and extremely great playability and tone. The T Styles have either vintage style 3 way switching and optional 4 way switching. I was looking for a particular T Style that was at The Nashville Vintage Guitar Show and also at their booth at Summer NAMM. Alas, I thought they finally sold it. After I gave a description of my all time favorite, the staff at the Guitar Mill suite pointed out the guitar and explained they had changed out the tortoise shell pickguard and knobs. The Holy Grail of T Styles, my all time favorite T Style was still available but my pockets are still short about 2K. At least I got the picture to remind me of that great Fralin loaded piece of perfection. There were other vendors such as the very upscale George L’s Cables and connectors. George L is showing that we can get very boutique and strive for perfection all the way down to the cables we use to improve the sound. If you don’t believe me, go to your local dealer and go head to head with the best. Take a George L guitar cable and a Lava Guitar Cables (with a tagged oxygen rating) and plug it straight into a well made tube amp such as a Dr. Z or Top Hat. You will notice an amazing difference in tone. In my own shoot out the Lava won hands down. I realized there was no way I was going to be able to get though everything. Luckily, some doors were closed and so the temptation to mess around with a 65 amp London for half an hour at Blues City Music wasn’t there. 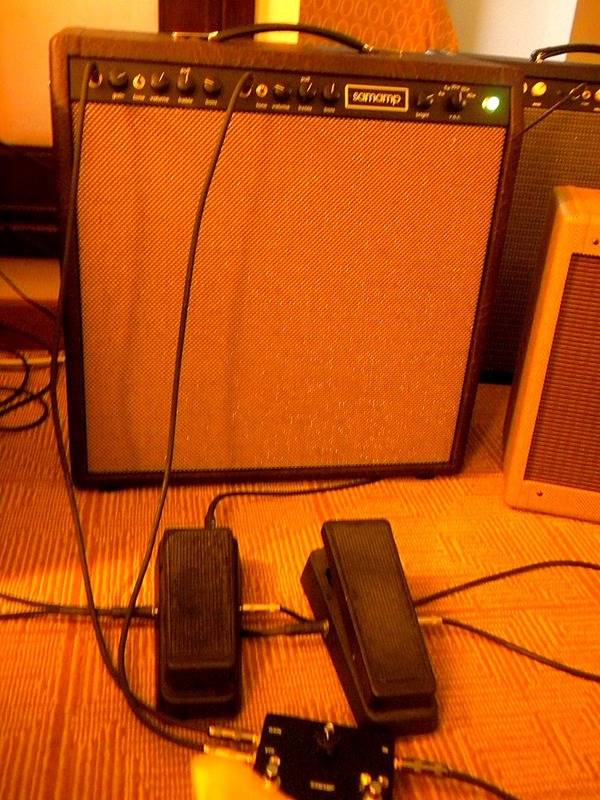 In a way, it would have been a waste since I had already recorded with one of Blues City Music’s 65 Amp London rigs at Leeway Music Studio in Memphis where they are located. They are fantastic, but, I wanted to try something new. 3rd Power, you can't ignore this! Okay now we’re talking, 3rd Power Amplification and the strangest looking rig I have ever seen. The HLH 100 caught my attention when it was reviewed in another publication. I had to see if I could hear it on YouTube and I found video of Ford Thurston jamming on this triple cabinet rig at Nashville Summer NAMM 2009. Jamie Scott, CEO & Designer, demoed the stage rig himself. After explaining the center cabinet being ran dry by the tube head and the output transformer being tapped and ran to another stereo power amp, which he had rigged to the two outside cabinets and had a TC Electronics rack piece running the two outside cabs wet I immediately thought of Eddie Van Halen’s rig for the last several years. Jamie said I was right but that Steve Lukather was probably the first to be known for that. But, when Jamie started throwing down some Van Halen licks, I went back to my original “a-ha”. This could be a modern version of the “brown sound”. Not to say it wasn’t exquisite because it was. I could see Eddie endorsing this rig himself. It is definitely eye catching and memorable. The technology behind the design was amazing. The non-parallel wall cabinets and almost studio monitor design were very forward thinking in a good way. It was the complete opposite of building the perfect “retro”. He did have a new practical “little guy” amp which seemed not only more accessible but still sounded amazing. The new American Dream amp sounded incredible. Ford Thurston did swing by and when he changed up his Guitar Mill T Style for a Les Paul and threw down some ZZ Top riffs, I really got the grin. It was cool to see it had a little “Have mercy” in the tank. I would have liked to try it out myself but this appeared to be more of a show presentation than a hands-on demo. Okay. I guess I will have to see if I can find a 3rd Power American Dream in Nashville to mess with myself. There was something for everybody guitar, but my mind was starting to warp from all the different shapes and tone. I had to start being picky plus I was running out of time. I stopped in the Delgado Guitars room. Maybe a little Nylon Spanish guitar would ease my rocked out head. I spent just a few minutes in there trying out a couple of acoustics. 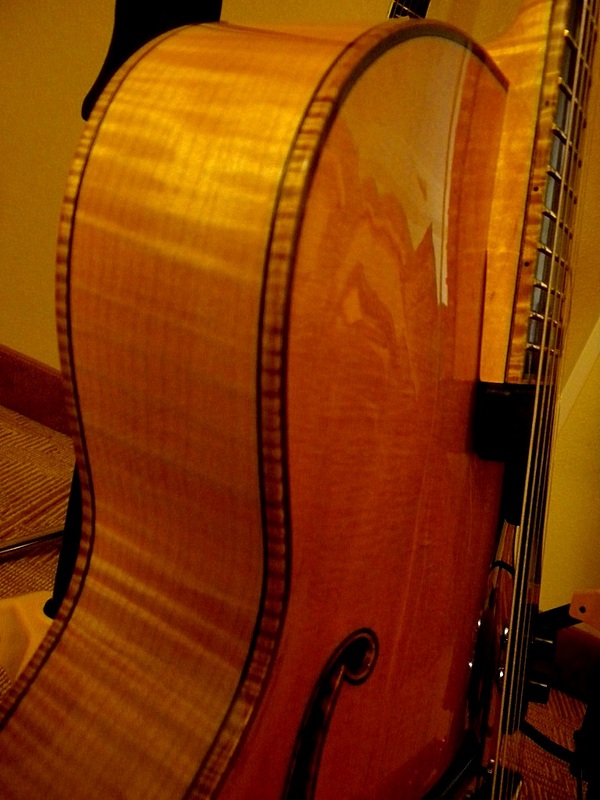 These are beautiful guitars that have a hand built tradition since 1928. I would like to spend more time at their local shop some time. There was a not a lot of Bass things to be had, but, Chopper Anderson at Alien Audio was sharing a suite with Simple Amps and while I waited to try out Simple Amps, I talked with Chopper and was shown the workmanship of his local build basses. 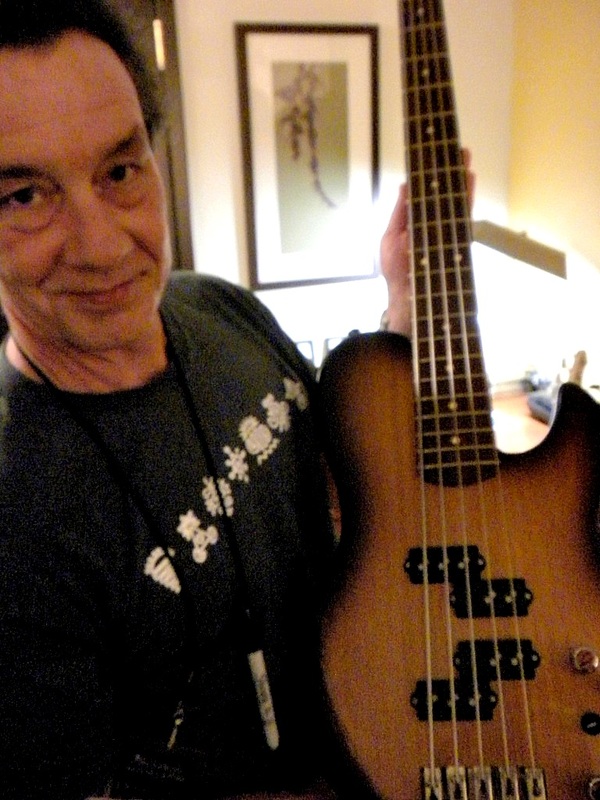 With two models, the Lunar Bass and Constellation (think Yamaha shape). The best thing was the preamp section designed by Mo West. I explained I wasn’t a Bass Player per se but always had a Bass on hand at the house. I did do some Bass duties in a jazz band a few years ago. He wanted me to try it out with his bass rig taking up a corner behind the main display. It sounded great and played great. I suggested he get one in the hands of Victor Wooten. Chopper said that Travis Carlton is already using one. I saw him play with his Dad, Larry Carlton, at Leipers Fork on the fateful day of the May 1st Nashville flood. A gig I will never forget. He sounded great to me. Chopper was very amicable with a Bass novice like me. A player always wants to try something out. I felt like some vendors understood that and others didn’t. Simple Amps sounded different than anything else I had tried at the show. The lower wattage amp didn’t seem to have as much character as the Big Iron 6LA. The 6LA had tons of lean headroom. The preamp section sounded different. Was it “Supro” like? Not quite. I had to ask and was explained it was similar to the old Magnatone front ends, so there you go. I made one last stop at Samamp before I left only to hear another guitarist say the “VAC 23 was the best secret of the show”. It was 6 o’clock and time had run out. Luckily, I had decided to bring one of my own guitars, because, if I had not, I may have had to use some of the strange selection kept by the amp builders, such as an old Dan Electro, a Japanese Les Paul 60’s lawsuit guitar or a Chinese made Firebird sort of. In Nashville, it would have been practical to have a Tele, Les Paul and Gretch nearby for standardized testing. There were a few builders I wish were there such as Top Hat or on a more esoteric boutique history thing Dumble Amplifiers . It was a great way to spend a Saturday afternoon in Tennessee.